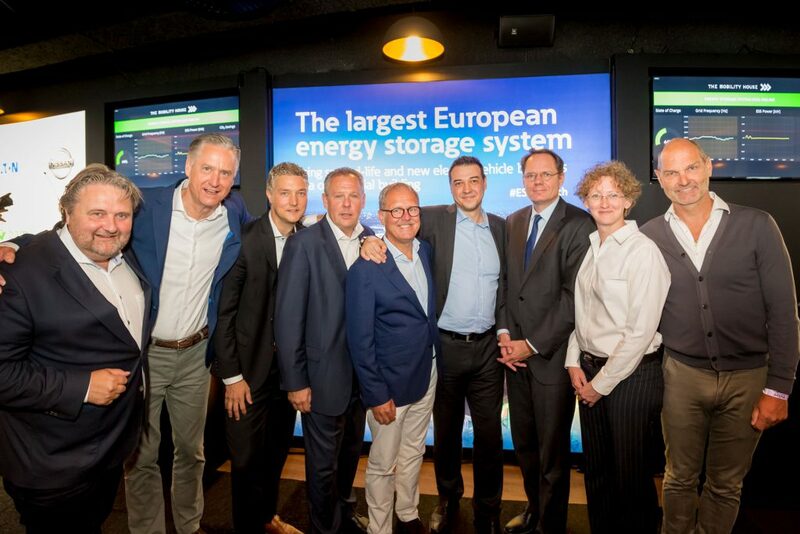 Today the largest European energy storage system using second-life and new electric vehicle batteries in a commercial building was made live. Amsterdam Alderman Udo Kock conducted the official opening ceremony. This unique project is the result of collaboration between Nissan, Eaton, BAM, The Mobility House and the Johan Cruijff ArenA, supported by the Amsterdam Climate and Energy Fund (AKEF) and Interreg. 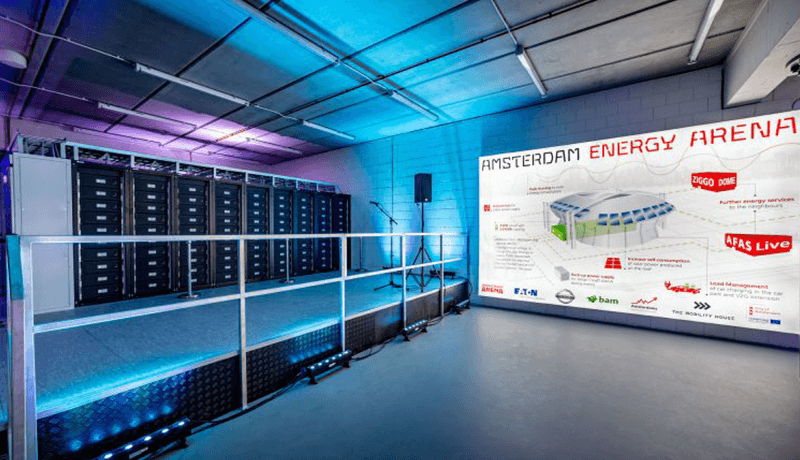 he energy storage system plays an important role in balancing supply and demand of energy in the Johan Cruijff ArenA. 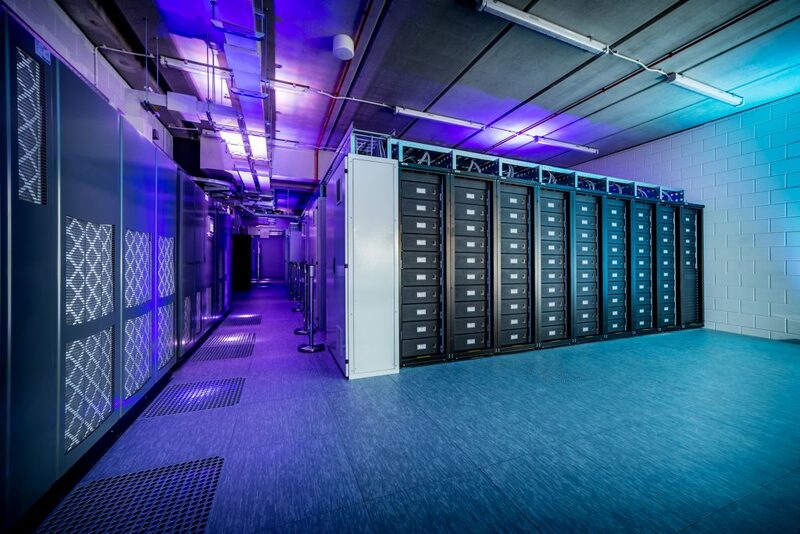 The storage system has a total capacity of 3 megawatt, enough to power several thousand households. This capacity also means that the energy produced by the 4,200 solar panels on the roof of the ArenA can also be stored and used optimally. The energy storage system will provide back-up power, reducing the use of diesel generators, and provide relief to the energy grid by flattening the peaks that occur during concerts. 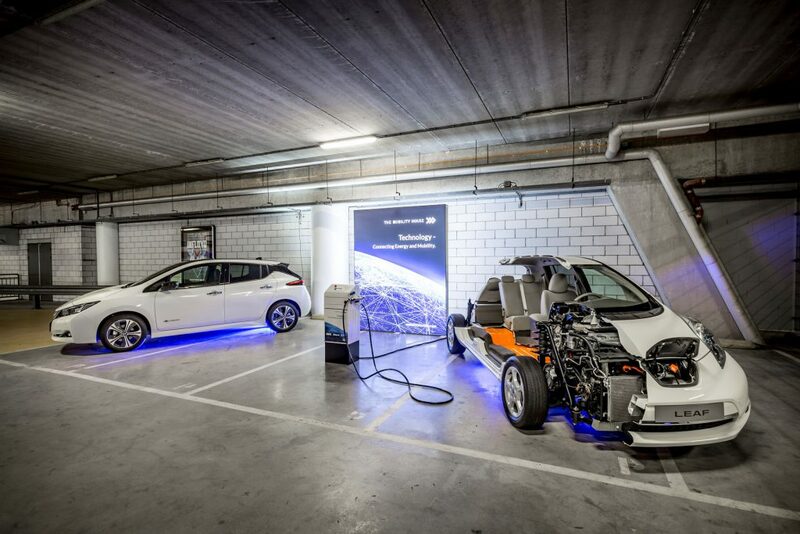 For the energy storage system, The Mobility House provides an intelligent hard- and software solution that manages the battery in multiple use cases. By providing grid services, grid stability is guaranteed and the operation of additional expensive diesel generators for the ArenA is no longer necessary. The required interfaces to the ArenA’s energy management system and to the Dutch grid operator TenneT have been also designed and will be operated by The Mobility House. As next step up to 200 electric vehicle chargers (uni-/bi-directional). The focus here will be to integrate an innovative vehicle-to-grid applications. 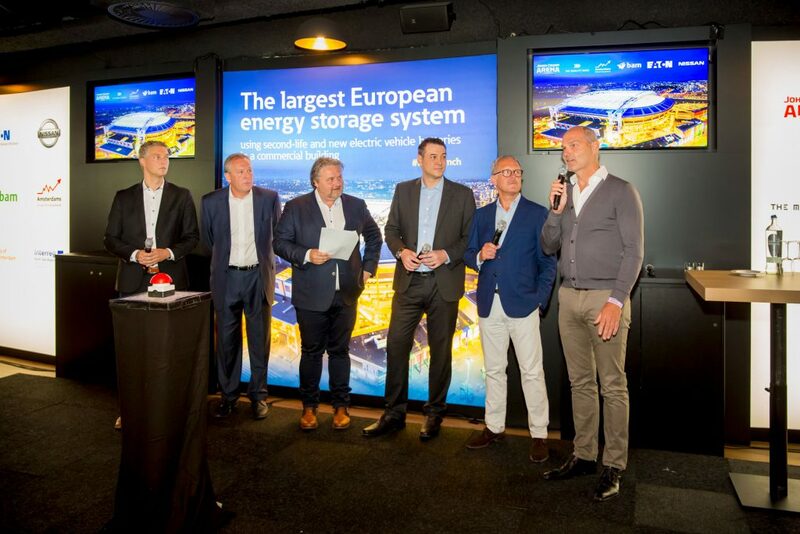 “With the energy storage system in the Johan Cruijff ArenA, we provide another opportunity to store renewable energies. Thereby the project brings us one step closer to realizing our vision of an emission-free future,” says Thomas Raffeiner, CEO and founder of The Mobility House. 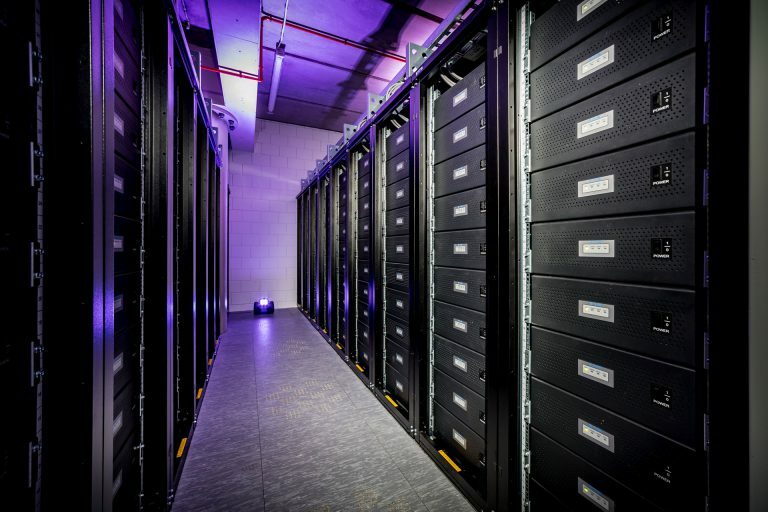 ” Our technology already enables us to commercialize more than 2000 vehicle batteries on the energy markets in various projects as stationary storage systems. Consequently, technically it is already possible to intelligently integrate electric vehicles into the grid to provide grid services. It will bring the energy and automotive worlds even closer together and pave the way for innovative and sustainable business models”. 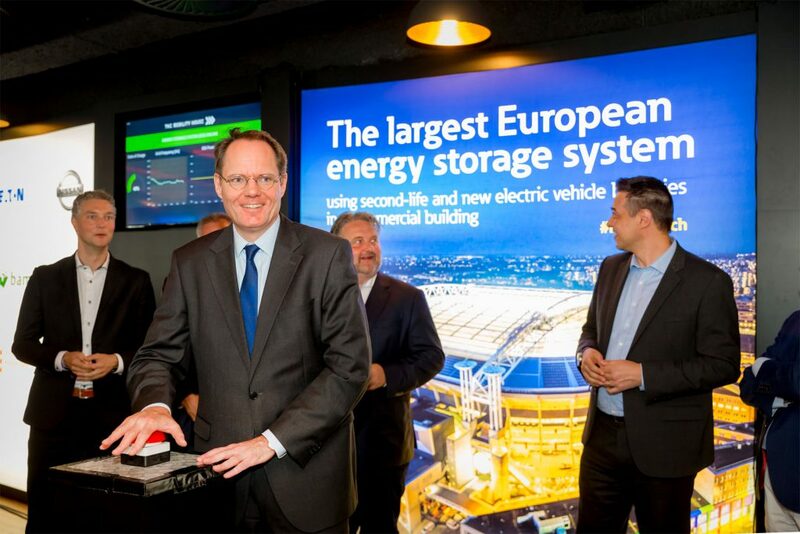 Here you will find all images of the energy storage system launch in the Johan Cruijff ArenA. The link will be updated in the next days continuously with pictures.